My name is Tina, thank you so much for allowing me to post my garden plan. This is my first time doing a garden, and you can follow my progress on my blog Dewdrop Garden. I appreciate any advice I can get. My dad suggested I use pavers instead of wood for the raised bed, and I think it looks really nice. I am super excited to see what I can grow. Here is my plan so far, I have a couple spots that are to be determined. I would appreciate any comments as to if this is a good layout or not. I know I am going to have to hurry up and get my carrots, lettuce and spinach planted ASAP. I am planning to plant tomatoes in their own pot, probably 3 plants in the pot since it is a pretty large pot. I didn’t plan enough ahead, so I have not started any seeds indoors, is too late to start my pepper seeds inside for transplanting later? Wondering if I should buy pepper plants at this point. I am also planning to make a separate bed for strawberries. Thanks again for your advice. This blog has already been so helpful to me in figuring out how many plants I will be able to plant in each square. 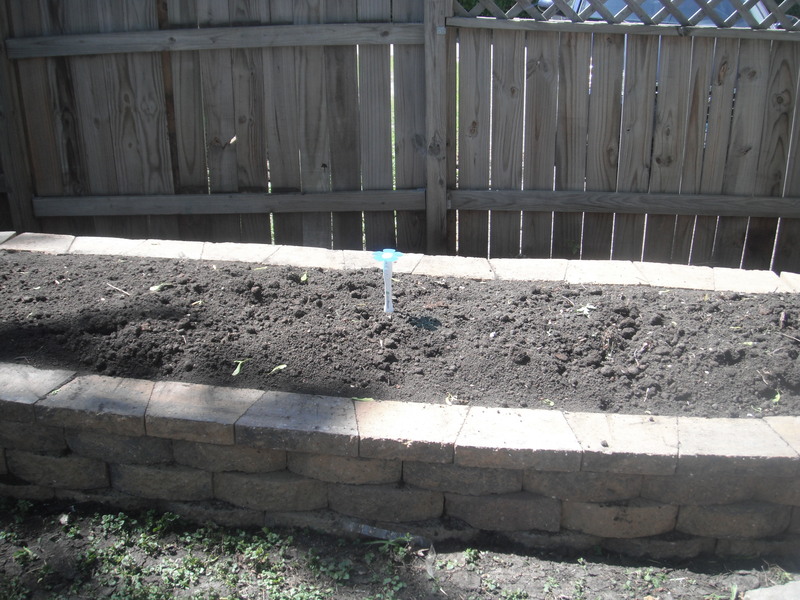 Tina, Thanks so much for blogging about square foot gardening in Minnesota. I live in South eastern Minn about 45 miles east of Rochestor. My Zucchini produced, produced and produced some more. My friends had to lock their car doors or they had a big surprize!! My husband thinks we could live all winter on Z.
I also put in a 4×8 Lasagna bed in my garden. Planted 3 hills of cucumbers in that. They did very well. Made lots of pickles and salads. I did traditional planting of 3 hills of muskmelon next to the fence in my garden. I thought they would never ripen as they were so small but then remembered they were Minnesota Midgets. Very good. Planted some more tomatos on the edge of garden and also in my flower beds. They tended to take over the flower beds. Wont do that next year. Tomatos did not want to ripen very fast. I wrapped a lot of green tomatos in newspaper and put in garage at news of first frost. I started unwrapping them and cooking and freezing for sauce and soup. So I am gradually getting quite a few in the freezer and still eating fresh ones on my sandwiches. Yum. The smaller green tomatos, I sliced and made into pickles. I had used up all my dill so decided to try Mrs Wages Kosher Dill Mix. (Gasp) I like to make my own homemade. They were to die for! Her seasoning is right on the money. Then made some bread and butter tomato pickles and that seasoning was also perfect. Tasted like my Moms recipie that I have been unable to find. I am making another bed outside my garden for next year. I want to plant some sweet potato acorn squash seeds that I bought at Seed Savers in Decorah this fall. Kinda doing the lasagna bed thing again there. I am going to plant Zucchini on the edge of my garden this time too as it took over my SFG space. Will put the shorter stuff in my square beds. Will try carrots and potatos this year. Have not had luck with them in the past but this is much better soil for them now. My strawberries have died out in there small bed the last 2 summers. Want to build a vertical PVC pipe with holes for any new strawberry volunteers that pop up over the winter and that will free up another bed for someting vining. I am wondering about the raspberries and blueberries that you are growing in pots. Will they live through the winter?? I am unfamiliar with these new pots but Minnesota winters are harsh. Be sure to let us know how that goes. Things seem to be going pretty good in my garden so far. Some things are doing better than others and some things have finally started to come up. I have a question now, we had a pretty good rain fall a couple days ago, it must have gotten muddy. All my plants stems and some of the lower leaves are covered in dirt. Should I try to remove that dirt or let it come off on it’s own? Amber – I went to Midwest Hydroponics last night and bought 6 of the smart pots for my blueberries and raspberries. I was surprised at how compact they were, all the pics I saw of them they were filled, so I didn’t realize they folded down like they do. Debbie – I am not sure about cross pollinating between Melons and Pumpkins. This is my first garden, so I am not sure about a lot of things. I did change my layout though since I made that post, I now have the pumpkins, watermelon and cantaloupe in the back and they will get a trellis. I love how you have things planned out, but I have a quick question about placing the pumpkins and melons so close together. Will they not ‘mix’ or, I should say, cross pollinate as they grow? yes, you can put a raspberry plant in one of the really big containers. I have one of those as well. For planting the tomatoes, I just checked my square foot garden soil temp here today- it was 60 degrees, so a bit too cool yet to put in the tomatoes and peppers. I am hoping maybe by the weekend the ground temp will be the 65-70 we should probably have before putting them in. Thanks Emily! I’m so glad my dad suggested the pavers, have already gotten a lot of compliments on the bed. Thanks for the advice. I did end up buying pepper plants last night. I bought two tomato plants and another pot so they will have their own pot. I have some ideas of what I am going to do for the trellises, but haven’t got them yet. I plan to put the two mint plants I bought in a container. First, I have to say that that the pavers are beautiful! 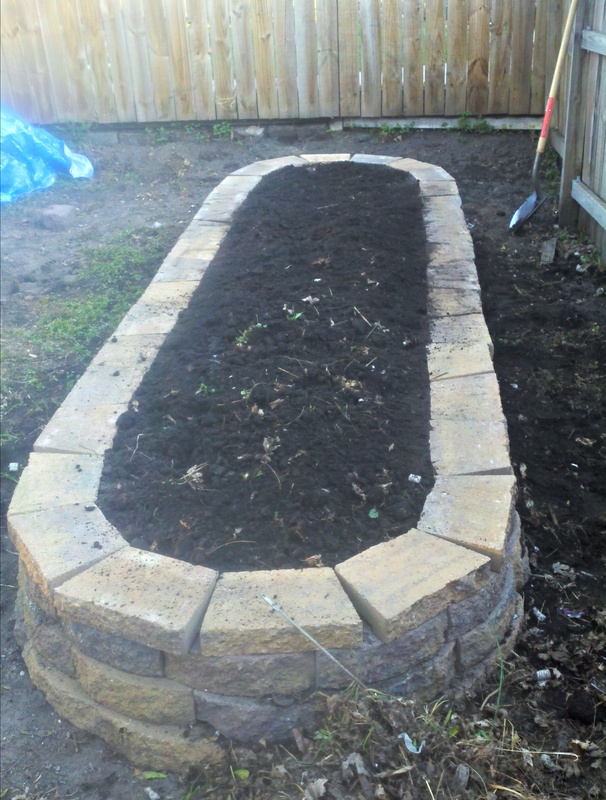 You did a fantastic job designing and building your garden bed. *Tomatoes: give them at least 4 square feet each. If you’re doing pots, probably one per pot. *Peppers: buy them! I don’t recommend starting seeds your first year anyway. There’s too much risk for things to go wrong and be very discouraging. *Berries: yes, give them their own space (each of them). I’ve never grown berries, but it’s on my list of things to learn more about. *Trellis: you probably know this, but be sure to trellis peas, pole beans, cukes, watermelon, pumpkin, and cantaloupe. Otherwise they spread and will cover everything in the garden. It looks like you have room for that. *Garlic: plant in the fall. Some say you can plant in the spring, and I suppose you can. But it grows best over the winter harvested in early summer. *Basil: you can gain more space by planting basil around other things–lettuce, tomatoes, etc. It repels aphids and won’t take up too much space at first. If you have it with lettuce, you can let the basil take over in that square once the lettuce is harvested. *Mint: be sure to plant it in a contained space or a pot. It spreads like a weed. *Hardening off: always assume you need to harden plants off. Better to take 2-3 days to acclimate a plant than to lose it! We’ve had an early spring too, and so that’s great for cool-weather veggies that can tolerate frost. For some it is tempting to plant out tender and very tender veggies too soon–in my area it has been warmer than usual, but it still gets too cold at night and when it storms for tomatoes. You’re probably safe planting them now for Yellow group, but I’m waiting another week or so (I am Green). Amber – Thanks for the info on the Smart Pots, they sound really neat, I checked out Midwest Hydroponics, those pots are very reasonable. I like the idea of doing the blueberries in pots because I am not sure how long we will live at this house, so if we do move I can take them with me. Do you think I can get away with putting raspberries in one of those pots, maybe a large one? Early spring sure was odd here, I know what you mean, it made me want to start planting my garden in March (which even for a first time gardener, I knew that was too soon.) I just bought my tomato plants last night, so not sure when I can put them out, when do you usually put them out? I am not sure if I need to harden them off still since I bought them at a store, so it will probably be a week or so before they go outside all the time. love the garden layout! If you are planting carrots, you could also plant radishes with them at the same time. The radishes will be done very quickly (generally less than 30 days), leaving room for the much slower germinating carrots. I also grow blueberry bushes in pots and they work well. Just remember you have to have acidic soil. I add coffee grounds (mine have been in the pots a few years) to help with their acidity. If you do put some items in containers, you may want to consider getting some SmartPots. They are a fabric container for growing plants. I also am trying these for the first time this year. I am also in the Twin Cities metro area, and there is a place you can get them locally (Midwest Hydroponics). I am doing some herbs in these as well. You could probably put them down in front of your pavers on the ground and grow lots of herbs, or herbs that are invasive such a mint. As the other poster mentioned, this would allow you to open up space in your garden for the bigger plants. Good luck on your garden! With our warm spring, have you decided yet when you are going to put your tomatoes out? This year has been harder for me to figure all that stuff out with our warmer spring. Thanks Ken! I didn’t realize it would take 4 weeks for the peppers to sprout. I was out tonight and bought pepper plants, rosemary, and 2 tomato plants, I also picked up a couple mint plants. I bought a second pot, so I will put my tomato plants 1 in each pot. Question about the plants I bought, do I still need to harden them off? Or should they be okay to plant right after buying them? I have a strawberry pyramid on order along with 50 plants to fill it, I also ordered 3 blueberry plants and 3 raspberry plants. Tomatoes are notorious for killing each other in pots (well, at least fighting a bit) unless that pot is monstrous, it’s best to stick to 1 a pot, or at least make sure its large enough. Hot peppers, and other peppers, however, can do quite well in pots. Pepper seeds can take 1-4 weeks to sprout, and then they start very slowly. I’d say it’s a bit late to start them from seed. In fact I intend to start mine a full month sooner than I did this year. A blueberry bush should do fine in a garden without taking over, though they can grow to be rather large. You can buy bare root raspberries (though, again, it’s a bit late in the season for it) which should be cheaper and they’ll grow very well (mine are this year) from that. Though you won’t get any raspberries the first year, and for blueberries, you are ‘supposed’ to pick off the flowers for the first 2-3 years so it develops awesome roots. Strawberries can do well in planters, pots, hanging baskets etc… if you have enough space you can bury the above ground runners to make new babies (otherwise cut them off). I’d plant calendula here and there for insect control. Also the basil can help about nightshade plants (tomatoes, peppers…) and the dill is good for cucurbits (cucumber, melons…). Alliums tends to also be a good co-plant for nightshades (for pest control) I would plant the garlic closer to the peppers. I’d consider growing a few of those herbs in pots (which tend to do well) so that you have more space for large plants (such as tomatoes). The rosemary, parsley, oregano, cilantro and the like. Look up companion plants that you can put together with others as I mentioned above. This saves space, helps the plants grow, and provides some insect control. Make sure you don’t need to reach through hot peppers to get to anything (depending on the heat variety) the capsaicin can rub off on you as you do so, leading to unexpected and unpleasant situations. Thanks for adding my post! I have changed my plan since I wrote that post. I have put all of the plants that need to be trellised on the side closest to the fence and moved all the peppers to the right side because that area gets the most sun. I did end up doing some planting yesterday, so I can’t wait to see how it goes.